I was recently reading an engineering magazine article (I know, I need to get a life) and came across a question that set me to thinking..."how did people stay cool before we had chillers?". After all, in the grand scheme of life we have only had chillers and air conditioning systems for a very short time. So what did people do before those things existed and what can we learn from that? One of the first lessons from the past is that hot air rises. Seems obvious doesn't it? Believe it or not there is actually a company that is successfully convincing people that by making their air even hotter than everyone else they can do a better job of keeping people comfortable from 20 or 30 feet above them. But that is a different story for another time. Because people realized that hot air rises, many early structures in very warm climates would be built with very high roof lines. This would allow the hottest air to stay above the people and increase their comfort. Many of those structures would also have vents or openings at the highest point of the roof so that the hot air could escape. As that hot air left the structure it would be replaced by cooler outside air near the floor level. A continuous circulation pattern would develop that kept the "cooling cycle" going. 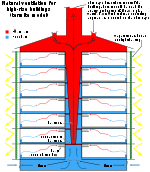 The taller the structure, and the hotter the air, the faster this cycle would operate. Today, we call that phenomenon "stack effect" and you see it in every tall building elevator shaft in the world. You also see it in chimneys for residences. After the invention of air conditioning though we seem to have forgotten one of the key elements of this natural cooling cycle...venting the hot air out of the building. In most modern air conditioned buildings we keep the hottest air inside the building and just keep cooling it back down in a constant cycle that requires compressor or chiller energy. In many cases the hot air inside the building is still cooler than the hot air outside the building so this might make sense during the hottest months of the year. However, in the case of a data center or server room, the hot aisle air is usually much hotter than the air outside...but most data centers use cooling equipment that constantly tries to cool down that hot aisle air resulting in huge energy consumption. Some systems also take advantage of the "stack effect" in a shorter building by recognizing that any heat source in the space will create it's own "mini stack effect". Cooler air will be drawn towards the heat source and the hot air above the heat source can be exhausted. This creates some natural circulation in the space and is one of the key principles behind "displacement ventilation". Another lesson from the past is that evaporating water will make air cooler. We actually use that very same principle in modern chiller systems that include a cooling tower. The cooling tower is nothing more than a very large evaporative cooler. In the old days people would use wet cloths or reeds in a window opening and when air entered the building through those wet items (probably accelerated by the building "stack effect") the entering air would get cooler and the people would be more comfortable. Today there are many types and sizes of evaporative coolers available, such as those from Alton and Aztec divisions of Mestek, and they work even better than those primitive early methods. But no compressor or chiller energy is required. Of course there are building construction techniques that are also based on lessons from the past. Positioning a building so that the smallest outside wall area is the one that sees the most sun will help keep the occupants cooler. Using "thermal mass"...thick, heavy, walls...can also keep occupants cooler by storing cool night air energy in the wall and releasing it slowly during the hottest part of the day. Again, we often build very light weight buildings today and try to compensate by adding insulation but nothing beats two feet of solid rock. Some architects are working to revive this technique and research is continuing on using chemical treatments on walls and ceilings that allow them to store energy longer. One case where creating a lot of "thermal mass" might not be such a good idea is in the data center world. Depending upon how the hot aisle air is handled it might actually be a good idea to make the walls very thin so that the heat can escape to the outside through the walls. Finally, the use of shades and window coverings is also a key lesson from the past. Some companies, such as the American Warming division of Mestek, offer exterior solar shades that actually track the position of the sun and change angle in order to maximize the shading effect. There are many other lessons from the past that could be discussed but the key is to stop and think about how we used to do things. Sometimes adapting ideas from the past to ideas from today can result in the best overall solution.